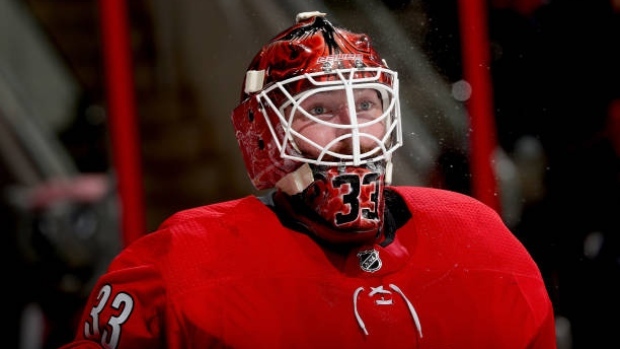 Carolina Hurricanes general manager Don Waddell says goalie Scott Darling is taking a personal leave of absence. Since signing a four-year contract with the Hurricanes in 2017, Darling has struggled. This season, Darling has appeared in just eight games with the Hurricanes, going 2-4-2 with a 3.33 GAA and an .884 save percentage. He was waived in November and assigned to the AHL's Charlotte Checkers. Darling's struggles have continued there as well, registering a 3.40 GAA and an .882 save percentage with a 5-6-2 record. In 2017-18, he appeared in 43 games with the Hurricanes, going 13-21-7 with a 3.18 GAA and an .888 save percentage. He was originally drafted by the Arizona Coyotes in the sixth round (153rd overall) of the 2007 NHL Entry Draft. Darling established himself as the backup to Corey Crawford with the Chicago Blackhawks for two full seasons, winning the Stanley Cup in 2015 before signing in Carolina.